Then I have some other elements, like other text inputs, textareas, etc. When the user clicks on that input with #subject, the page should scroll to the last element of the page with a nice animation. It should be a scroll to bottom and not to top. The animation should not be too fast and should be fluid. I am running the latest jQuery version. I prefer to not install any plugin but to use the default jQuery features to achieve this. I got the code from the article Smoothly scroll to an element without a jQuery plugin. And I have tested it on the example below. I wrote this lightweight plugin to make page/element scrolling much easier. It's flexible where you could pass in a target element or specified value. Perhaps this could be part of jQuery's next official release, what do you think? 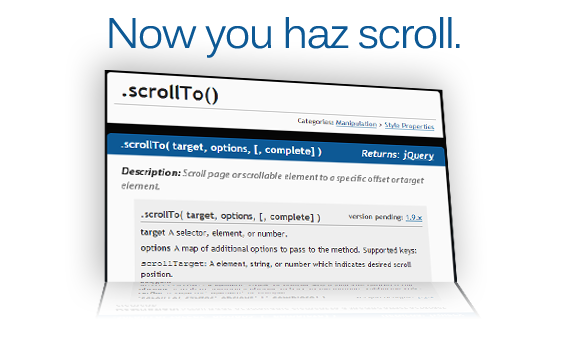 scrollTarget: A element, string, or number which indicates desired scroll position. offsetTop: A number that defines additional spacing above scroll target. duration: A string or number determining how long the animation will run. easing: A string indicating which easing function to use for the transition. complete: A function to call once the animation is complete. Would make in sort that if a hash tag is found in the url, the scrollTo animate to the ID. If not hash tag found, then ignore the script. The solution by Steve and Peter works very well. But in some cases, you may have to convert the value to an integer. Strangely, the returned value from $("...").offset().top is sometimes in float. A compact version of "animate" solution. Thanks to Tricia Ball for pointing this out! With this solution you do not need any plugin and there's no setup required besides placing the script before your closing </body> tag. On load, if there is a hash in the address, we scroll to it. And - whenever you click an a link with an href hash e.g. #top, we scroll to it. In most cases, it would be best to use a plugin. Seriously. I'm going to tout mine here. Of course there are others, too. But please check if they really avoid the pitfalls for which you'd want a plugin in the first place - not all of them do. The animation doesn't respond to user actions. It carries on even if the user clicks, taps, or tries to scroll. If the starting point of the animation is close to the target element, the animation is painfully slow. If the target element is placed near the bottom of the page, it can't be scrolled to the top of the window. The scroll animation stops abruptly then, in mid motion. and that's it. Of course, there are more options. That works even if a border on the html element is set. Very simple and easy to use custom jQuery plugin. Just add the attribute scroll= to your clickable element and set its value to the selector you want to scroll to. Like so: <a scroll="#product">Click me</a>. It can be used on any element. // RUN ONCLICK ON OBJECT WITH ATTRIBUTE SCROLL=".SELECTOR"
$('html, body').animate(...) does not for me on iphone, android chrome safari browser. I had to target root content element of the page. I wrote a general purpose function that scrolls to either a jQuery object, a CSS selector, or a numeric value. * @param offset    - the offset in pixels from the target position, e.g. *                    be scrolled. default: "html, body"
For what it's worth, this is how I managed to achieve such behavior for a general element which can be inside a DIV with scrolling. In our case we don't scroll the full body, but just particular elements with overflow: auto; within a larger layout. It creates a fake input of the height of the target element, and then puts a focus to it, and the browser will take care about the rest no matter how deep within the scrollable hierarchy you are. Works like a charm. How can I move to <a name tag slowly?